Thoughts from the Hill: Contest !! 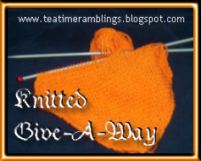 While looking at Wordless Wednesday posts, I came across this fun contest at Tea Time Ramblings. She is "giving away 2 knitted hanging tea towels and three knitted dischcloths in a variety of patterns using the brightest of bright crochet cotton from Bernat". To enter this contest, all you have to do is post a link to the contest on your blog and add your name to the Mr. Linky on her blog. Posted by Lisa at 8:05 p.m. Thanks for stopping by and sharing the contest info - good luck! I love that ww pic - cool glasses! April 18, 2007 at 11:07 p.m. Thanks for sharing, I might have to stop by over there. If I don't get a chance to do it, I hope you win.